Assassinate Vittoria Vici at her own wedding. Vittoria Vici addresses her guests in Solitude. Attend the wedding at the Temple of the Divines in Solitude. Assassinate Vittoria Vici. For a bonus, kill her during her speech. "Oh! Well, you tell your Stormcloak friends "hello" right back at them! This is a day of healing! Legion, Stormcloaks - all are welcome here!" "Ha ha ha ha! Yes, yes indeed! Hail the Imperial Legion! Hail the Stormcloaks! Hail Solitude and the Eight Divines! On this glorious day, we honor everyone! Ha ha ha ha!" "Oh, no need to be shy! My day is your day! Please - eat, drink, make merry! We're all friends here!" During the reception, she will also tell the guests: "Please, enjoy the festivities! This is a day of peace and happiness, when Imperials and Stormcloaks join together, as equals!" or "Please, enjoy yourself!" She will then stand up with her fiancé, Asgeir Snow-Shod, and enter a door to reach the balcony, where she will begin addressing her guests. Assassinate her while she speaks to earn the bonus reward. There are several ways you can choose to accomplish the goal (see this section for more details). If you speak to Babette, she will tell you about a loose gargoyle statue situated above the balcony: "It's no fair. I love weddings. Astrid should have given this contract to me. Instead, she's got me visiting cities, assessing security. How boring. But listen, I think I can help you. The wedding reception is outside the Temple of the Divines, right? In Solitude? If so, the bride will probably address the crowd from the balcony. It overlooks the courtyard. Well, there's an old statue there. I've seen it. Hanging right over where she'll be standing. Old means weak. Weak means it could fall. Hmmm?" If you travel to the wall above the balcony, you can push a loose gargoyle statue when Vittoria makes her address to the wedding guests. To access this balcony, enter the Temple of the Divines, then go up the stairs to the right and through the door at the end of the corridor. You can also access this balcony by going up the stairs located to the right of Castle Dour. The gargoyle is there whether you talk to Babette or not. If you speak to Gabriella, she will tell you: "I hope you don't mind, but I took the liberty of surveying the site of the reception. There's a small parapet, just opposite the balcony, that would prove an excellent spot for a long-range kill. I left something there for you. If you're inclined to take that approach." If you take the door to the northwest of the temple entrance, you will end up on a ledge located opposite the balcony where Vittoria addresses the reception. On the ledge are six arrows, an Elixir of True Shot, and the unique magical bow Firiniel's End. You can simply shoot the bride from this spot; she is easily killed with a single sneak attack from the magic bow you are given. It is best to use these free items now to be sure she is killed immediately. This is especially important if you have a low Archery skill and are planning a ranged attack. Like the gargoyle, the bow is there even if you haven't talked to Gabriella. Nazir will warn you about the possible outcome of murdering Vittoria: "Slaughtering the Emperor's cousin? At her wedding? Those guards will be out for blood. Wouldn't surprise me if the crowd jumped in too." Veezara will advise you to plan your escape route beforehand: "Your contract sounds simple, which means it certainly will not be. Getting into that reception will be easy, but have you thought about getting out?" Pickpocket a Frenzy poison into the groom's inventory as Vittoria addresses the crowd. He will immediately drink it, turn, and kill her, provided that the poison is of sufficient strength. Casting a spell of Frenzy will achieve the same effect, though the Quiet Casting perk may be needed to avoid detection. To kill with a particular poison, you will need a poison of better than Weak strength and the Poisoned perk. Another way to deal with this assassination without incurring a bounty is to turn into a werewolf or a vampire lordDG (without being seen and therefore incurring no bounty), and then use the door to the overhead balcony where she is located and kill her. A good spot to transform while Vittoria is speaking is the small nook behind the loose gargoyle. By crouching (sneaking) inside this nook, you can avoid incurring a bounty for transforming, and you can swiftly jump down on the bride before the crowd notices what's happening. A very blunt approach is to follow the happy couple to the balcony where the bride gives her speech. If you crouch down behind the couple you will not be seen by them or the guests. You can kill the bride and by killing the groom as your last witness you will get rid of the bounty and both are joined in death. Another blunt approach involves dropping onto the balcony, crouching, and using Unrelenting Force. You could also purchase an invisibility potion and use it when killing Vittoria, guards shouldn't know that you did it. Once Vittoria is killed, pandemonium will break loose. Veezara will then appear, sent by Astrid to offer a distraction while you escape. Even if you weren't detected and got away with the assassination undiscovered, Veezara will still charge in and initiate combat with everyone, drawing attention away from you so you can simply walk out. Sometimes, the guests will still give chase, in which case you can escape the city quickly by using a stairwell under the Castle Dour tower bridge, near the market. One way of avoiding a bounty is to fast travel to the Sanctuary to collect your reward as soon as Vittoria is killed and before the guests turn hostile. Upon your arrival back to the Sanctuary, Astrid will congratulate you on your success: "With Vici's murder, you've started us down a path the Dark Brotherhood hasn't traveled in centuries. The assassination of an Emperor. And now, your reward. A unique spell to summon a legend of the Dark Brotherhood. His soul serves us now in death, as his body once did in life". This spell will allow you to summon the powerful spirit of an assassin to fight by your side. If you fulfilled the bonus requirements, she will also give you a leveled amount of gold. Astrid will then carry on: "Now then. Time to proceed to the next stage of the plan. Go and speak with Gabriella. She's been helping me arrange your next contract." When you approach her again, she will tell you: "As I said, go speak with Gabriella. She's been assisting me with your next contract. This Emperor business, well... it does involve everyone." The next quest, Breaching Security, will now begin. Completion of this quest will make another minor quest unavailable, unless you completed that one first. Some of the guests at the wedding include Elisif the Fair, Alexia Vici, Vulwulf Snow-Shod, Nura Snow-Shod, Vivienne Onis, Kayd, Rorlund, Pantea Ateia, Lodi, Noster Eagle-Eye, and a Penitus Oculatus agent. After Veezara appears, if you are not being pursued, you can talk to all of the wedding guests to hear their individual reactions to Vittoria's murder. Even if you are not detected when killing the bride, the guests will still turn hostile, and attacking them will incur a bounty. Raising and lowering arms will count as yielding and will not earn you a bounty. If you are a thane of Solitude, Elisif the Fair will defend you from hostiles. She will even attack her own guards. 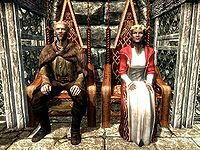 Plautis Carvain and his wife can be found traveling in the wilderness, and claim to be heading towards the wedding, although they never appear and are not mentioned afterwards. Plautus Carvain and Salonia Carvain may be found traveling after the quest is complete, and claim to have been robbed by bandits, and missed the wedding. Using an Invisibility potion, power, or spell may help you avoid a bounty if it is used right after the murder, although the guards may still locate and attack you, causing the bounty to be incurred. If Elisif is shot by you or someone else, she will equip a bow and the arrow (if usable) for the rest of the game. Vittoria's body can be looted for her wedding dress, wedding sandals, wedding wreath, and her wedding band before it disappears. If the body is gone, you can find Vittoria's remains in the Catacombs, in a coffin on the northeastern side of the longest tunnel. If you kill her via an arrow shot without being detected (invisibility and line of sight breaking cover), you can escape the town without Veezara appearing. 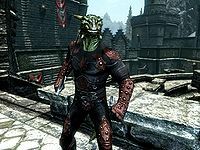 in such a case the next time you visit Solitude and walk by that part of Solitude you will be attacked by guards. ? The northwestern entrance to the temple courtyard remains closed for the rest of the game. The wedding decorations also remain permanently. Astrid sometimes doesn't give you the bonus reward even if you killed the target while she was on the balcony speaking. This may occur from using the loose gargoyle method or assassinating her at night. This bug can be fixed by entering setpqv DB05 Bonus_var 1 in the console after killing the target. Dropping the gargoyle statue may glitch her body inside the balcony, preventing her body from being easily looted. The body can actually be looted between the lower levels seats where they sit before going up to the balcony. It can't be seen, but is still lootable. The flute player may continue to play after Vittoria is killed and chaos occurs, despite the vocal reaction he gives. A little while later, the fighting will cease and everyone will resume their previous activities as though nothing ever happened. 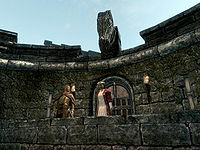 Veezara and the Penitus Oculatus Agent will simply be standing in the middle of the Castle Dour courtyard. ? Vittoria sometimes will not give a speech and only get up and walk to the tower entrance, turn around and then sit back down repeatedly. ? Reloading the game may fix this. Sometimes an arrow shot directly into her head in stealth mode will cause her to be pinned onto the building about three times higher than you can reach. Should this happen, the wedding guests will sometimes ignore her death, as will her husband. Veezara, however, will not and will begin attacking everyone. Once this begins, the guests may attack you as well and occasionally the Penitus Oculatus Agent. ? If Vivienne Onis is dead, she appears in the courtyard, wearing only her undergarments. The body is lootable, but empty. The Penitus Oculatus Agent and Silana Petreia will appear to be investigating, but talking to them yields only the normal wedding dialogue. The body is not present before accepting the quest from Astrid. If Nura Snow-Shod, Vulwulf Snow-Shod, or both, are dead, they appear in the courtyard, wearing only their undergarments. The bodies are not present before accepting the quest from Astrid. 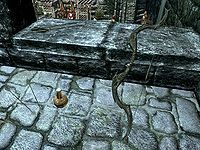 Once Vittoria is dead and you reach the Report back to Astrid quest stage, the quest marker may erroneously point you to the Temple of the Divines in Solitude. Once you enter the temple, the quest marker is updated to correctly point you to the Dark Brotherhood Sanctuary. If you open the items menu immediately after killing Vittoria, a bounty of only 40 gold will be added. 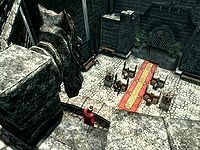 After the disastrous wedding, a Penitus Oculatus Agent may be permanently stationed beside the door leading to the balcony from where Vittoria gives her speech. Sometimes after the Bound Until Death quest is activated, there will be a rare chance that the wedding area is completely empty. The guests that are supposed to be at the wedding are either walking around Solitude or not there at all. Vittoria will still have her essential flag if you attempt to kill her when she is walking around town and you will still get attacked by guards, as well as getting the standard bounty for attacking a citizen. On rare occasions, the wedding area will not even have the decorations, yet Vittoria will be walking around Solitude in her wedding dress. Reloading from a previous save does not seem to work, and the cause/fix is unknown. The bounty you receive may not be payable. ? 10 I must journey to the Temple of the Divines in Solitude, attend the public wedding reception of Vittoria Vici and Asgeir Snow-Shod, and kill the bride. I'll receive a bonus if I kill Vici as she addresses the crowd. 200 Finishes quest I have killed Vittoria Vici, the Emperor's cousin, at her own wedding, and everyone will assume it's related to the ongoing war. The Emperor will now be forced to visit Skyrim to deal with the aftermath, paving the way for his assassination. The following empty quest stages were omitted from the table: 0, 255. On the PC, it is possible to use the console to advance through the quest by entering setstage DB05 stage, where stage is the number of the stage you wish to complete. It is not possible to un-complete (i.e. go back) quest stages, but it is possible to clear all stages of the quest using resetquest DB05. This page was last modified on 2 February 2019, at 03:42.